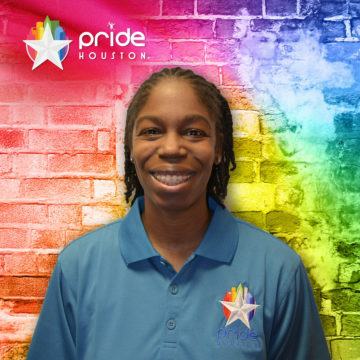 Thasia Madison – Pride Houston, Inc.
“Netflix, Reese’s and Sweatpants. Sarcasm connoisseur. Born and raised in New Orleans; brought to Texas via Hurricane Katrina. Oil and Gas IT professional by trade, poet by birth, started writing sonnets from the womb, youth influencer by nature and an alumnus of the almighty PVAMU Panthers. The most extroverted introvert you will ever meet. I prefer my puns intended and my clothes Zeta Phi Beta blue. A social entrepreneur and a huge supporter of local businesses, thriving art and culture communities as well as passionate about volunteer work. STEM (Science, Technology, Engineering, and Mathematics) is my way of life.